Lauren Bullock was carried into St Patrick’s Church in Donaghamore this morning in a pink and white casket. She had a bright future cut tragically short, mourners at her funeral were told. The funeral of Morgan Barnard this morning. Her coffin was pink and white, with flowers painted on the side. 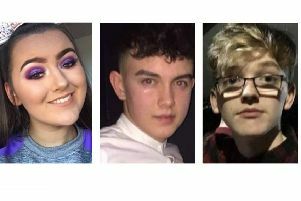 Lauren died after a crush in a queue at a disco in Cookstown on Sunday night, along with two other teens, Connor Currie and Morgan Barnard. She was borne through the church yard in Donaghmore followed by an enormous but silent crowd who had accompanied her on her final journey. Schoolchildren lined the street while the bell at St Patrick’s Church tolled. She possessed a zest for living and loved people, a priest said. 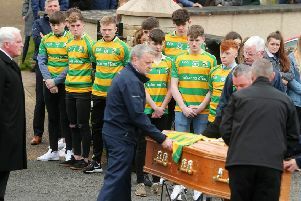 Hundreds of young friends dabbed back tears as they bade the 17-year-old farewell at St Patrick’s Church in the Co Tyrone village of Donaghmore. Catholic priest Fr David Moore said she loved to get dressed up, have her nails done, and have her hair just right. The priest said Lauren was the “essence of a wonderful and caring daughter, sister, grand-daughter, niece to her family and a loyal and caring friend to so many others”. He told her grieving family: “So many people have been touched by the events of Sunday night. Take consolation in that, a sign of what people in the community and local area truly thought of her and yourselves as a family. “Aged only 17, Lauren was well in the process of making her mark on her home, her school, this community, her circle of friends. She was ‘living the dream’, energetic and full of life, doing and enjoying all the things that made her happy. Fr Moore said Lauren’s friend described her as having a “warm and bubbly personality with a very infectious smile”. “That’s a lovely picture for all of us to have of her in our minds today,” he said. “Lauren was getting on so well in Saint Patrick’s College in Dungannon and her teachers there can attest to how eager and very able a student Lauren was. She had a bright future in front of her and we know she still had so much more to contribute to our community. “Nothing seemed to get Lauren down. She had such a positive outlook on life and a real zest for living. Lauren loved people as much as they loved her and was a real ‘socialite’, with lots of friends and people who admired and looked up to her. A funeral pamphlet had a photograph of Lauren with her dog on the front. Purple-clad members of Lauren’s cheerleading group, Euphoria All Star Cheerleading NI, formed a guard of honour as she was taken from the church. Other cheerleading squads were also in the line-up as well as dozens of children from local schools. The line of wellwishers stretched from the church doors up the street past a Celtic cross. The priest said Lauren’s “real passion” was cheerleading. The teenager was an active member of the Eurphoria cheerleading group. “Lauren was a girl who loved to get dressed up, loved make-up, her nails done, a bit of style, her hair just right,” he said. “She only had to come into the family home at number 27 and they knew she had arrived. Family values and family time was so very important to her. Lauren’s remains were carried from the church, the clergyman in front, as school children formed a long line to both sides. It was a young person’s death, a funeral in which young people played a part in the service and a ceremony in which youthful attendees appeared to outnumber the adults. One girl clutched the pamphlet with Lauren’s picture on it and dabbed her eyes with a tissue. Lauren’s close family walked arm in arm behind her coffin. A fatherly arm was on one youngster’s shoulders. Several mourners had a purple ribbon attached to their jackets.